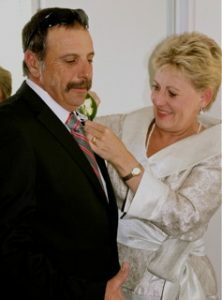 Attention to detail – helping the groom’s father with his buttonhole! Celebrant Joy helps with floral button holes, making sure the ceremony area is free from rubbish (yes, you’d be surprised what you may find! ), checking your ceremony backdrop is picture perfect and taking candid snaps to capture your special day. Phone now with your ceremony date and time to check availability. Then we can meet for a confidential, obligation-free meet and greet. I love ceremonies and am waiting to make yours a Joyful Occasion!